Marissa Farrar: And for the 3rd day of Creepfest meet Zombie-fanatic, Stant Litore! And for the 3rd day of Creepfest meet Zombie-fanatic, Stant Litore! Zombies are hot stuff at the moment. 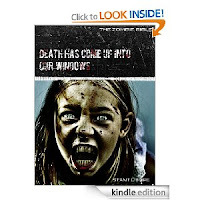 Where for the last couple of years, vampires have been all the rage, zombies are definitely taking over! One person who has loved zombies for years before they became fashionable (if such a thing is possible!) is the author Stant Litore! He's here today for the 3rd day of Creepfest to share some of the love!!! M.F. Hi Stant! Clearly, you have a love for Zombies. Where did this love start? S.L. It started when I first saw Night of the Living Dead as a teenager. The dead closing in on the house, pulling one woman out through the window and feeding on her in an unholy communion … it was, well not love, but something at first sight, that’s certain! I actually have a terrible fear of zombies. My wife and I watched the Dawn of the Dead remake while we were dating, and I fetched a stout wood-ax and placed it by my armchair. Much to my good fortune, my future wife was more amused than alarmed by that. M.F. What are your favourite zombie books or movies? S.L. Night of the Living Dead, definitely. Books: World War Z by Max Brooks and Valley of the Dead by Kim Paffenroth are the best of the best. Paffenroth actually has the gall … and the panache … to rewrite Dante’s Inferno, in a novel in which Dante as an exile is inspired for his future poem by his travels through an infested land in Eastern Europe. The story is poignant, poetic, brutal, and stays with you – demandingly – after you close the book or power down your Kindle. M.F. If a zombie apocalypse were to happen this Xmas, how would you survive? S.L. Probably not. I have a wife and two daughters, and it is very likely that I would perish defending them. In any case, I think my survival likelihood is a bit low. That said, I don’t give up. I don’t think I’ve ever given up on anything that mattered to me. And I know a few things about taking out zombies. I’ve done my research. Just think the likelihood is low. If the apocalypse happened fast, I suppose I’d relocate my family to whatever nearby facility I could fight or persuade my way into, and hunker down a bit. If slow, well, it’s a long road to Canada, but I always did appreciate a pretty drive. M.F. Tell me a bit about your novels and where we can buy them! S.L. Oh, you will love The Zombie Bible. Think zombies. In the Old Testament. Or in second-century Rome. Think of ancient cultures struggling not only to survive but redefine what life means, what justice means, what it means to have hope in a world defined by its hunger. That’s a kind of story that can speak really powerfully to the world we find ourselves striving in and surviving in. You can get the first two for your Kindle or your Nook. As I write this, the first volume, Death Has Come Up into Our Windows, is the #11 bestselling horror story on the Kindle, and it is worth a read. It will mark you.